Discussion in 'Indivisible' started by Cellsai, Dec 5, 2015. So the campaign is finished and there was something like 80+ NPC tiers bought. I'm sure all y'all are dying to talk about what you're thinking of doing with yours, despite them not going to be really discussed with Lab Zero for a looooong time. But for now, I don't see the harm in setting up shop in here. Just a thing you should remember about your NPCs though - unlike in Skullgirls, where basically anything was okay, Indivisible's NPCs will be much more restricted in what will be allowed. I don't know what those restrictions are and I doubt L0 fully know yet either. I would assume 'must be human or a pet' is one of those restrictions though. Don't get too attached to your character designs. As I said, L0 probably don't know exactly what the restrictions are on characters yet, but there will be restrictions. Be prepared to have to change some of your designs to fit the rules L0 eventually make. Guest Incarnations are special cases. Just because they have a time traveling, skateboarding dinosaur and a 15 foot tall, chaingun wielding robot does not mean you will be allowed anything close to that. Use the next several months or year or whatever to really think about your character and how you'd like them to appear in a way that makes sense! Don't lock yourself into a corner now only to find you need to rework your design later anyway! BallotBoxer and BrandX+ like this. So are we posting our characters? jam1220, The Dave, Fumako and 2 others like this. Thank you for making this Cellsai! Armageddon11, The Dave, The Prophet and 3 others like this. Here's an enemy I made. I don't really know if he is boss material. Aden, Smilax, jam1220 and 4 others like this. I don't know what those restrictions are and I doubt L0 fully know yet either. I would assume 'must be human' is one of those restrictions though. Aden, jam1220, The Dave and 2 others like this. Was this at all inspired by Devil May Cry? The jacket/hair reminds me of Vergil and the sword of Nero's Red Queen. The Vergil influence is intentional, but his weapon's actually just a sabre in a sheath. Was told this on the official Twitter page in October "NPCs pretty much should be human or pets. Monsters there’s a lot more leeway." However I feel Lab Zero still want humans to look like regular humans rather than superheroes or hybrid creatures for the most part, I know that where Incarnations are concerned my current avatar was rejected outright by Mike Z so I feel she wouldn't have been eligible for NPC either. Well hopefully when they see my character they know that he is wearing a Tragedy mask. Yo, here's a challenge to get your creative juices flowing. My challenge: draw your NPC as if they were from a different region. Fedoras and trench coats are not common wear in the Eastern mountains style Zebei, Kushi and Sangmu wear. Short yukatas aren't regularly seen in French nobility catalogues. How about enlisting your pirate in Baozhai's crew, @Armageddon11 and dress him in region appropriate gear? That's not just a challenge for @The Prophet , @BrandX+ and @Armageddon11 - any of y'all who have NPCs planned for the game, or hell even if you don't have an NPC slot should try it. North888, StairwayTDC, The Prophet and 5 others like this. I just finished drawing this guy. Would he fit in if he is from the same region as Naga? as some kind of Hero? in the Same Area of Naga Rider? Sure i mean that's cool. Naga Rider is a super hero from the same city as Kampan and Thorani. He's supposed to stand out as something totally bizarre, so I wouldn't really design a character with the idea of him fitting in with Naga. That's like designing an NPC for Gotham City but making him look like Batman - that's not actually what a citizen of Gotham looks like. And the challenge is not to create a new character. That's relatively easy. What would you suggest for the Iron kingdom? StairwayTDC, The Prophet and TaNooki like this. Ok, took me awhile but I have this. Fizzxwizz, Cellsai and The Dave like this. Can we post ideas for characters even if we didn't make that tier? I still can get the NPC tier? Because I'm planning to get that tier before the campaign ends officially. Yeah, go ahead. This is all in good fun. Yup. Most of the custom tiers like Design an Enemy, Design a Boss, etc were removed from the campaign, but Design an NPC is still available. What regions are Hazam and Kampan from? Brainstorming on what to do with my character, maybe mixing elements of Baozhai/Dhar/Antoine's designs... kind of dig the upper-class motifs as opposed to the straight-up warrior look of many of the other characters. Once an eccentric professor at the Tower of Wisdom, Hassam is now an eccentric adventurer and inventor. He has found a way to convert the surrounding energy of the world and nature, known as Prana, into the internal psychic energy, Iddhi, by way of a bizarre and rather clunky machine. Eager to study the effects of direct application of Iddhi, Hassam straps his invention to his back while traveling. An ardent collector of artifacts and a constant learner, Hassam views the ever-expanding Iron Kingdom and its intellectual oppression as the world’s greatest threat. Having recently learned of the fall of the Tower of Wisdom, he fears for the fate of his home lands, but has decided to continue his research for now. A cheeky thief with a flare for theatrics, Kampan is a burglar like no other. Her agility and bravado, along with the sheer destructive force of her arm, have earned her the nickname “Iron Mouse” among Tai-Krung City authorities. Originally a pickpocket trying to support her starving family, Kampan was arrested and pressed into service as a laborer at an Iron Kingdom ore processing facility. As an expendable prisoner, she was chosen to participate in a demonstration of the prototype new mining equipment under development there. However, the disastrous outcome of several test runs brought an abrupt end to the project, and the “unstable” arm was never completed. Upon liberating herself – and the prototype – from the facility, Kampan took a keen interest in its inner workings. Using bits and pieces scavenged during her larcenous adventures, she’s built the once-abandoned arm into a powerful tool and continues to improve upon it. would you care take a look at these quality watches, young lady? Uh, well I guess I'll post who I'm thinking about? Eh? 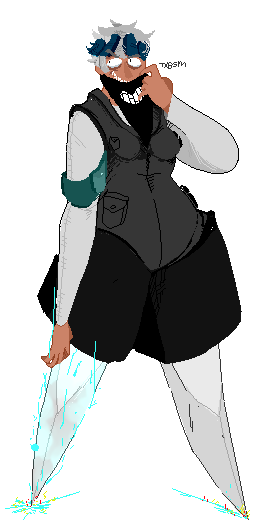 Malie Mars is an islander who is known for using her two giant golden disks to fight demons and whatnot. 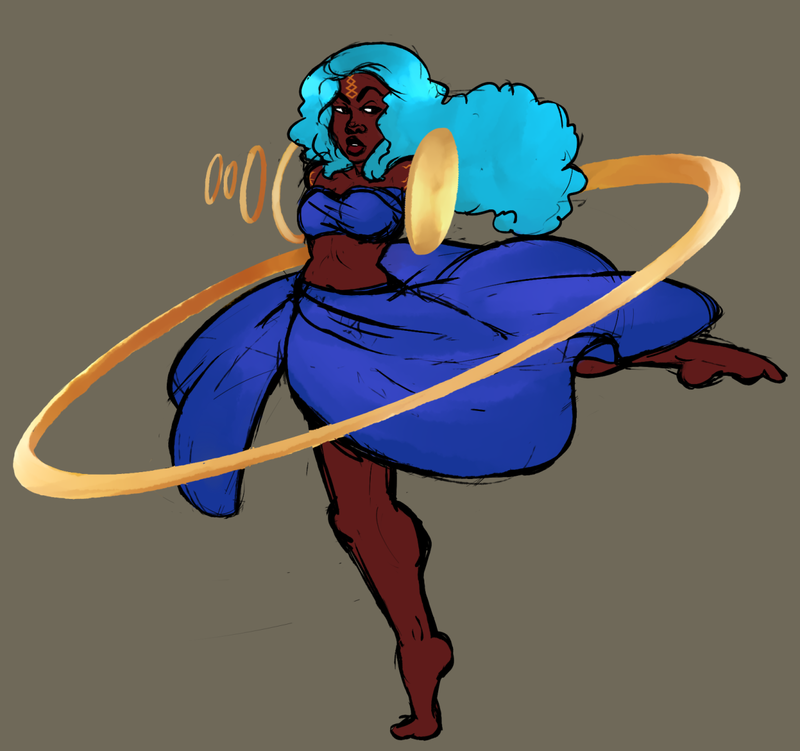 Golden rings melt out of the discs until she runs out of gold to hover around her, or circle her like the ring of a planet. Sur is a bounty hunter who specializes in knives. Most of her legs were replaced with two giant blades. Hidden batteries in puffy pants can electrocute blade legs. Astraeus is a merman that comes from a species of merfolk that are pretty fat. This is to combat the cold of the deep ocean they reside in. 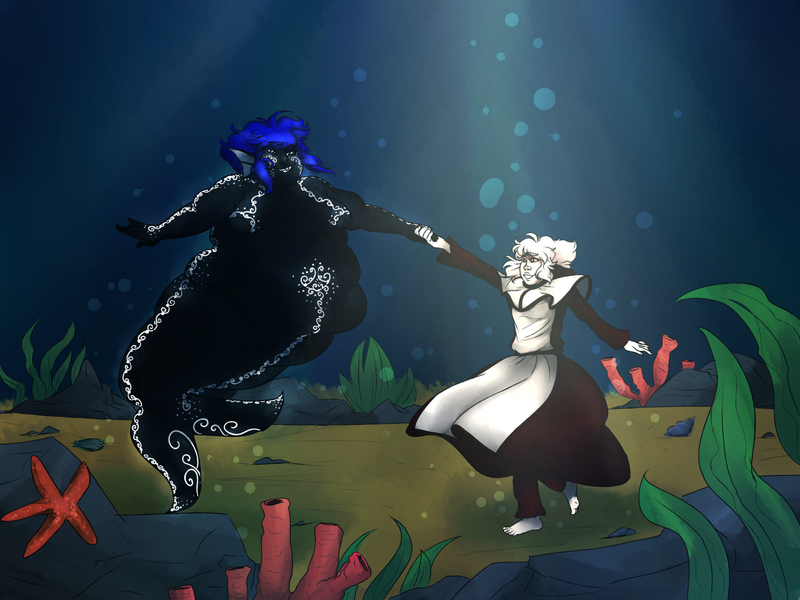 Their markings eventually glow like bioluminescent fish when their skin pigmentation changes their skin to become fully black to blend in with the bottom of the ocean, or if they become intimate enough, as they mate there as well. He walks on land using special crutches designed by his human boyfriend. I took forever on this, but whatever, here's mine! Choeygal, a Tibetan skeleton dancer. North888, The Prophet, Dr.Sanity and 1 other person like this.